In South Africa we have an organization that relies mostly on donations for funding. They receive a donation from a corporation of R50 000 (€5 000) per month. They need to raise R2 000 000 per year in order to function. So, this organization provides a small portion of that amount. A few weeks ago I was stopped and asked if I would please listen to an appeal. I started off by telling the young gentleman that I did not have money to donate. He did not want cash, what he wanted was for me to sign a debit order. They ask people to commit to donating a minimum of R50 per month and they use the corporate sponsorship to provide prize money to the people who sign up. To me, this is totally wrong. The people who donate will do so regardless of the possibility of winning money. Instead of putting up the R50 000 per month and trying to raise R2 000 000 they could bank R600 000 and try to raise only R1 400 000. This makes more fiscal sense to me. When I told the gentleman that I did not have the money to commit to this he told me that he needed 15 more people to sign up this month otherwise he would not meet his target and would not get paid. Herein lies problem number two. in my opinion. Instead of paying people to recruit donors, keep the money for what really counts. Once again, the people who believe in this organization and make use of it, will donate. I was quite affronted as I was made to feel bad that I am not in a position to give my money to him. But, I have a charity I support and to me they are more important. Do you donate to a charity? On coming home, the last thing I felt like was more complications. 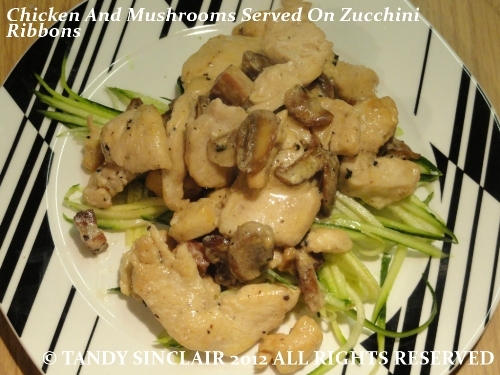 I was inspired to make a simple supper, and this chicken and mushroom sauce served with zucchini ribbons met the bill perfectly. thanks for linking this in, Tandy. Hope you have a fabulous weekend. Hi, Tandy! I decided to work at a hospice instead. It is such a rewarding way to give back. This looks like a great dinner.. and I love that the ribbons replace any starch! that is so wrong, and worth being on a soapbox for! The perfect thing for tomorrow, Tandy 🙂 Thanks! I love the simplicity of this dish. It sounds fantastic. What an awkward situation for you to be put in. The fact that he told you he won’t get paid if he doesn’t get his signatures? Really? Where is their moral base if they are trying to guilt people into giving money? Not the right way to get donations. On the subject of charities, I leave that decision to the “still, small voice” – then I know I can’t go wrong. The experience is document was a bit of a shocker! I do think charities do go about things the wrong way sometimes. I find that once I donate, I am harangued and it doesn’t feel very pleasant. I understand that they want money but they make me feel bad and that is not the way to get donations. I support QASA. Lovely recipe. Every time I press the “Like” button it shows “Unlike”. Very confusing. Nice recipe. I agree with you, charities or any business for that matter should not be allowed to employ people with the condition of bring me money and then I’ll pay you. It is immoral and degrading. Why our government allows it is beyond me.